Show your style with this cute crop. 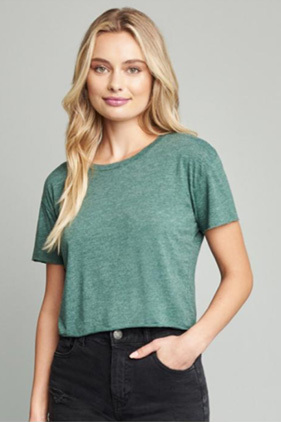 65% polyester/35% combed ring-spun cotton, 40 singles 3.5 ounce cropped tee. 1x1 baby rib. Relaxed crew neckline. Raw edge sleeve and hem. Cropped body with relaxed fit. Side seamed. Tear Away label.